Science has revolutionized our life. If our forefathers were to visit this world now they fail to recognize it. Everything wears a new look. Our houses, clothes, food, means of communication, manufacture of goods, methods of networking – all have changed beyond recognition. The speed with which science has been advancing is amazing and it is sure to bring about even more revolutionary changes in the future. Science aims at gaining mastery over the forces of nature. It strives to give man increasing power over his surroundings. Consequently, a person leads a more comfortable life than before. Similarly, the impact of science and technology on businesses has been immense. Talking about houses and construction, modular construction has changed the face of construction. Now it is actually possible to imagine an additional floor into an existing space, or a small portable guard house for security personnel, or modular offices, or even pre-engineered modular buildings that can be moved from place to another and adjusted as per requirement. Security is any businesses top priority and when they want to expand or relocate these prefabricated security guard houses are ideal since they are portable and adjustable. Guard shacks are cost-effective security checkpoints used by offices, malls, retail outlets, recreation centers, government facilities and more. Panel Built is widely chosen across America for prefabricated guard houses and guard shacks due to variety, convenience, and affordability. 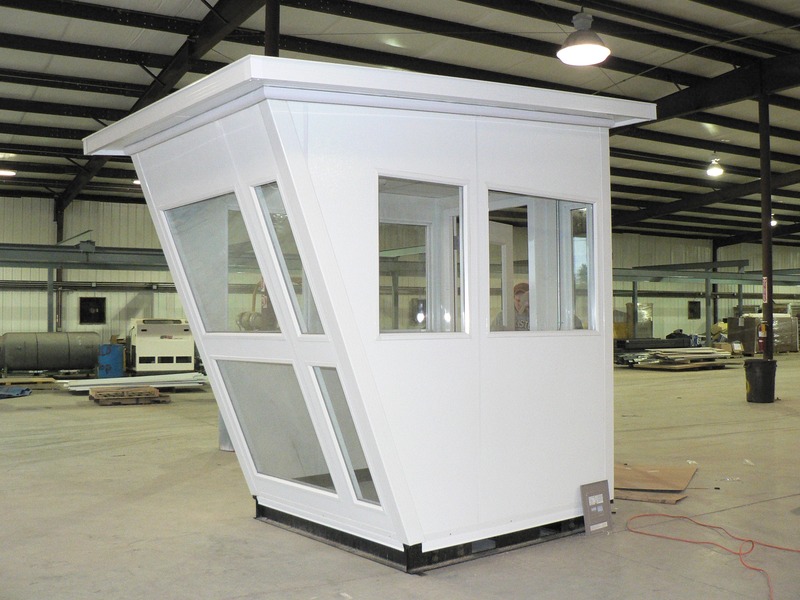 Portable guard houses are small modular structures that can be seen at entry checkpoints of commercial buildings. They are designed to serve the needs of the security personnel so they can check and if necessary stop people from entering a restricted area. Enterprises or larger companies often have multiple guard houses and security booths to ensure additional checkpoints at the entrances of their buildings. Guard shacks usually have one security attendant occupying it that can guide visitors or give them directions. The interior is perfect for one person and it usually has everything they need so they don’t leave their spot. Larger guard booths often include a bathroom or a surveillance area. Why is Panel Built one of the best companies that sell security booths online? There is no business concept without a security guard these days, and Panel Built is one of the best companies that deal in guard booths, guard houses, and guard shacks. Panel Built offers all types of guard houses and shacks with modular configurations that can be customized as per the customer’s needs. Prefabricated guard houses have a lot of benefits; these modular structures are fire resistant, wind resistant, and crack proof. Furthermore, Installation is easy and quick, service life is longer and reliable. Modular booths are versatile and have effective mobility and efficient. Panel Built ensures these modular booths are available to all online through the website and at affordable prices. Customized designs of these modular structures are offered by Panel built. Many additions, adjustments, and modifications can be incorporated in these structures. Usage of steel base not only ensures durability but also mobility from one place to another. A modular guard house is prefabricated and it is a cost effective alternative to conventional construction. These prefabricated guard houses have several advantages; easy and quick installation, low maintenance, re-locatable, durable, versatile and strong, low cost of engineering, suitability for remote locations, and affordable. Today we live in the ‘age of science.’ The wonders of science and technology which far excel the wonders of Nature have affected our everyday lives and the way we do business. Now all the inventions and discoveries tend to human comfort and happiness. Of the contribution of science to humanity, the most lasting is that of the scientific method which is objective and not subjective. It presupposes that our likes and dislikes, feelings and thoughts are irrelevant to the inquiries about Nature and its laws. Security booths at Panel Built are designed to perform primal functions i.e. protection of sensitive types of equipment and safety of personnel while regulating the entry and exit of people to a restricted area. These Security booths are designed while keeping in mind all environmental factors as well as various situations. Style preferences and designs are implemented as per need. Tested construction methods and quality equipment ensure many years of safety and a maintenance free service. These modular structures keep their appearance for years to come. A durable construction material used for security applications is steel which uses the seamless exterior surface with 14 gauges. Customized designs of the roof, walls, and doors make it unique construction equipment. It is a modular guard house structure that is movable. To secure the environment, employees’ safety and to ensure tight security such protection is essential these days. Due to an easy mobility of these guard houses, these booths can be shifted to the desired place as per need. Panel-built guard booth is more durable than the other guard booths available online. Movable modular security booths use material that improves the quality of air for personnel along with the practical use of the structure that improves security and limits waste. Modular walls do not use a lot of material which benefits the environment and reduces waste. The material for a modular guard house is reusable and recyclable. Installation is quick and renovation is easier and dust-free for such systems, hence it improves air quality. Prefabricated guard houses allow for incorporation of environmentally friendly features to the design, including the use of safer and natural building materials which are energy-efficient and easy on the environment. Space design is sustainable and made up of durable material for longevity, hence reducing the waste at each phase – from construction to reconfiguration.